BEST Proves that the Earth is Warming! This is too damned funny. Here we are, using the last ten years of BEST’s data. Well, heck. Yep, hotting right on up there. 21 Responses to BEST Proves that the Earth is Warming! LOL….you know you have to post that everywhere….don’t you? In the spirit of goodwill, I’ll even post it on the Repub hater’s post. lol, indeed. nothing like using 5 y/o data to prove something happening in the present. From Muller’s point of view, that’s really the WORST data. lol, Muller thinks the last ten years of the worst of the BEST? Let’s just look at the US. NOAA says no US Global Warming from 1889 to 1989. Then go here, and plug in 1990 – 2010. And the result is “you’re kidding” me. 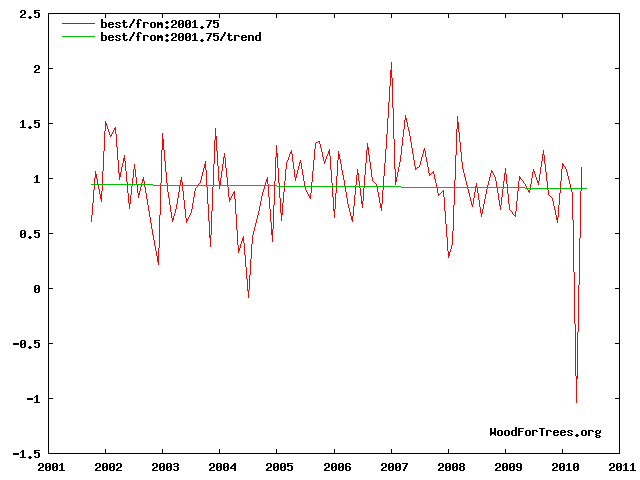 So no trend for 100 yrs to 1989 and then .26F/decade, which is only .26F because of 2 anomalous years. THIS is what Cali is crushing their economy for? This is why we are ruining our environment and inevitably our economy and standard of living with alternative energies for? THIS is what is causing the wildlife and fauna changes seen in hundreds of thousands of so-called “scientific” papers? Two slightly warm year causing .26F/decade for 2 decades, while the hundred years before were FLAT??? Yes, pin the skeptic badge right on my chest. Yeh, it makes perfect sense. Suicide by energy deprivation because it got warm a couple of years. Better yet, plug in 2000 to 2010, and US temps are down .66F/decade. This is responsible for all the climate change we see in the US?? A cooling period in the US? I guess it’s the hot air from everywhere else rushing in here, now there’s a theory that could be peer-reviewed i’m sure. Gosh, sure would hate being self reliant……lol, what’s bad is some of those pinheads think it would be a bad thing.